Land planted to grass after Jan. 1, 1999 is eligible to enroll in the carbon credit pilot project offered by the Chicago Climate Exchange (CCX) in most counties in Kansas (except in parts of the southcentral and southwest). There is estimated to be as much as 500,000 acres of grass plantings on Conservation Reserve Program land made after Jan. 1, 1999 in Kansas. 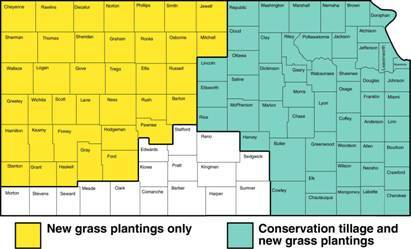 Unlike no-till acreage, new grass plantings are eligible for carbon credits in most of western Kansas, as well as eastern Kansas. Also, the carbon sequestration rate assigned to new grass plantings is higher than that assigned to no-till (0.75 tons of CO2 per acre on grass plantings as opposed to 0.5 tons of CO2 per acre for no-till). Recently, prices on the CCX have been about $4 per ton of CO2 per year. At the rate of 0.75 tons of CO2 sequestered per acre, that means that those who enroll new grass plantings in the carbon credit program could receive about $3 per acre, depending on the price at the time the credits are sold. Any grass land enrolled in the carbon credit program will have to remain in grass for the 5-year duration of the contract period – from 2006 through 2010. Producers and landowners who have land on which grass was planted after Jan. 1, 1999 can sign up for the CCX program either through a contract with the Iowa Farm Bureau or the National Farmers Union. The map below shows which counties in Kansas are eligible. Both the yellow and green counties are eligible for new grass plantings. Total U.S. greenhouse gas (GHG) emissions were 7,147.2 million metric tons carbon dioxide equivalent (MMTCO2e) in 2005, an increase of 0.6 percent from the 2004 level according to Emissions of Greenhouse Gases in the United States 2005, a report released on Nov. 14 by the Energy Information Administration. Since 1990, GHG emissions have grown at an average annual rate of 1.0 percent. U.S. GHG emissions per unit of Gross Domestic Product (GDP), or “U.S. GHG-intensity,” fell from 664 metric tons per million 2000 constant dollars of GDP (MTCO2e/$Million GDP) in 2004 to 647 MTCO2e/$Million GDP in 2005, a decline of 2.5 percent. Since 1990, the annual average decline in GHG-intensity has been 1.9 percent. Total estimated U.S. GHG emissions in 2005 consisted of 6,008.6 million metric tons of carbon dioxide (84.1 percent of total emissions), 611.9 MMTCO2e of methane (8.6 percent of total emissions), 366.6 MMTCO2e of nitrous oxide (5.1 percent of total emissions), and 160.2 MMTCO2e of hydrofluorocarbons (HFCs), perfluorocarbons (PFCs) and sulfur hexafluoride (SF6) (2.2 percent of total emissions). The secretariat of the United Nations Framework Convention on Climate Change (UNFCCC) released new data on Oct. 30 showing an upward trend in emissions of industrialized countries in the period 2000–2004. The UNFCCC report ‘Greenhouse Gas Data, 2006’ constitutes the first complete set of data submitted by all 41 industrialized Parties of the Convention to the Bonn-based secretariat. According to the secretariat, in the period 1990–2004, the overall emissions of industrialized countries decreased by 3.3 per cent. However, this was mostly due to a 36.8 per cent decrease in emissions on the part of economies in transition of eastern and central Europe (EITs). Within the same time-period, the greenhouse gas emissions of the other industrialized Parties of the Convention grew by 11.0 per cent. The UN’s chief climate change official pointed out that despite the emission growth in some countries in the period 2000-2004, Parties of the Kyoto Protocol stand a good chance of meeting their individual emissions reduction commitments if they speedily apply the additional domestic mitigation measures they are planning and use the Kyoto Protocol’s market-based flexibility mechanisms. The “Stern Review” focuses on the impacts and risks arising from uncontrolled climate change, and on the costs and opportunities associated with action to tackle it. It emphasizes that economic models over timescales of centuries do not offer precise forecasts - but they are an important way to illustrate the scale of effects we might see. The Review finds that all countries will be affected by climate change, but it is the poorest countries that will suffer earliest and most. Unabated climate change risks raising average temperatures by over 5 degrees C (9 degrees F) from pre-industrial levels. Based on the assessment of the science carried out by the Intergovernmental Panel on Climate Change in 2001, the Review calculates that the dangers of unabated climate change would be equivalent to at least 5% of GDP each year.